cleanmycoach.com is the official website of Indian Railway On Board Housekeeping Service facilitated for the cleaning of your coach when you are travelling in a Train. Clean my Coach clean the coaches twice in a day and also cleans any time as per the demand of the Passenger. How to Demand for a Coach Cleaning? If available Enter your PNR Number, Mobile Number and captcha code and click on Send Request. Message will be delivered to the cleaning staff and cleaning staff will take action within 15 minutes. 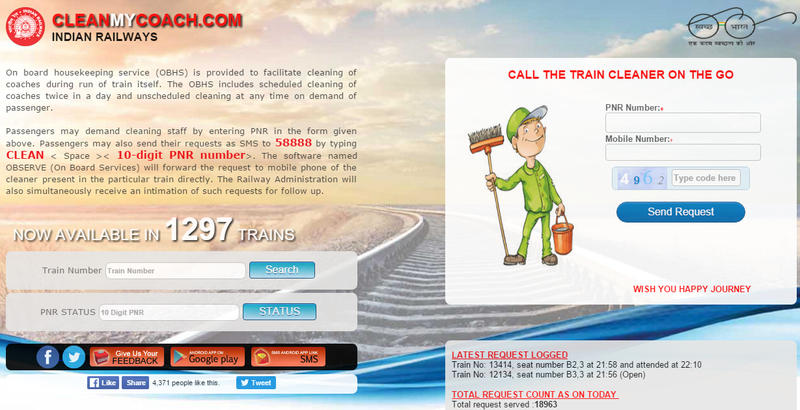 Download CLEAN MY COACH INDIAN RAILWAYS Android App and Enter your PNR Number and Mobile Number and Send your Request.